The idea of becoming a party-hating Jason Voorhees is one that could work. Unfortunately though, far too much of Party Hard is spent waiting for something to happen, instead of letting players be the one who trigger the action. I may be getting up there in age, but I still subscribe to the Andrew W.K. belief of positive partying. Who doesn’t love going out with a good group of friends and enjoying the night? And yet, in some ways, I can relate to the unnamed killer at the heart of Party Hard. I went to college, so I certainly understand his frustration over people being loud at all hours of the night. The difference between us, though, is that while I would just choose to ignore it, the Party Hard Killer decides to take matter into his own hands. Utilizing the tired trope of the police interrogation, the story of Party Hard is told to us by a police officer who went crazy tracking the killer. Being interviewed about the latest massacre, Officer John West details all of the serial killer’s appearances during Autumn 2000, and just why he grew to be so obsessed with capturing him. The seemingly tireless inspector always seems to be right on the trail of the maniac, but can never quite stop him, which leads to a devastating loss for Mr. West. I’m not sure if Pinokl Games’ effort really needed a story, and the one here does little to sway my opinion. The method of telling the plot is cliched, and the end twist, which you’ll be able to see coming from a mile away, is almost as bad. What really sinks the tale, though, is the horrendous voice acting from both Officer West and the man interviewing him. The interviewee talks in a scratchy high-pitched voice, while the grizzled growl of John West is right out of Troubled Cop 101. The plot seems like it should be darkly humorous, but for some reason the events are played completely straight. 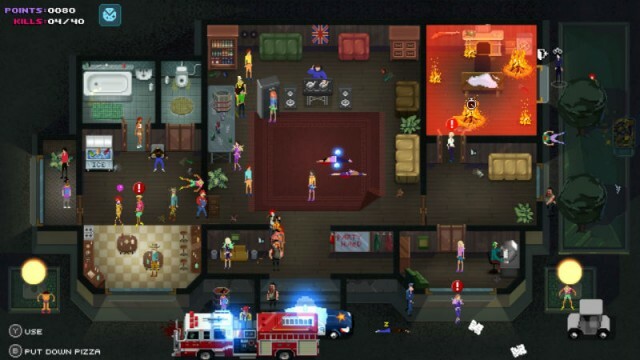 While the plot of Party Hard centers around the police, you actually play as the unhinged Party Hard Killer. After shutting down the party that rudely went past 3:00 AM, he decides to travel around the United States, killing every party-goer he sees. As that would imply, the main goal of each of the 12 levels is to eliminate every living creature on screen. Most of the time, you’re just murdering random humans, but there are a couple of animal deaths, including a dancing bear whom I wish didn’t have to die. You have unlimited time to accomplish your goal and the only way you can be stopped is either being arrested by the police or being killed by bouncers or secret agents. You have two ways of taking out civilians here. You can use your trusty knife to quickly stab them to death, or you can use the traps housed on each level. Most of the traps tend to make repeat appearances throughout the game, including the likes of exploding gumball machines, poisoned punch bowls and bear traps. Most of the stages also feature different ways for you to stay hidden, including areas to hide bodies (dumpsters, ice containers) and quick-escape passageways that are excellent for fleeing the scene of the crime. Additionally, different power-ups occasionally show up on a level. I really didn’t get too many of these during my playthrough, but the few I did get, such as smoke grenades and new clothes, were definitely helpful. Most of the traps can only be used once per level, so it’s best to use them when the party is in full swing. Unfortunately, once these deadly devices are used up, Party Hard typically turns into a game of waiting. After the party is whittled down to about 10-15 people, your only course of action is to stealthily take out each one with your knife. This means that you’ll spend a decent amount of time sitting around doing nothing while you wait for the inconsistent A.I. to decide whether or not they want to move around or not. The game quickly goes from exciting and chaotic to dull and boring, which is a pretty big party foul. Of course, you can just run right into these smaller crowds and try to quickly kill everyone, but the Party Hard Killer moves with all of the urgency of a sloth. Everyone, whether it be police officers or drunken Vegas parties, moves quicker than you, which is completely ridiculous. Maybe Pinokl Games is going for the Jason Voorhees style of movement, but Jason also wasn’t getting busted by cops or beat down by bouncers. For a game as open as this one is, it’s annoying that you’re better off playing it safe every level, rather than trying to take any sort of chance. As mentioned before, the A.I. is all over the place in Party Hard. Sometimes they’ll instantly accuse you of killing someone, even if you’re not really next to a dead body. Other times, though, they won’t even notice you stabbing someone within eyesight and dumping their body into the trash. Also, why aren’t these party-goers being more discouraged by the murders and disappearances that happen during their fiesta? Everyone goes back to their regularly-scheduled dancing no matter what you do. I don’t know about you, but if an acquaintance of mine was viciously stabbed during a party I was at, I would probably book it the hell out of there. Although it may not have the same blistering action, the colorful visuals of Party Hard are certainly reminiscent of Hotline Miami. All of the character models are colorful and vibrant, and while the levels may lack detail, both due to the style of art and 2.5D camera angle, they’re pleasant enough to look at. The influence of Dennaton Games’ shooter can also be heard in the electronic soundtrack that accompanies each level. It’s a solid score that not only fits the mood of the game, but it’s also pretty enjoyable to listen to on its own. There’s an interesting idea at the core of Party Hard. If you’re willing to look past the absurdly violent premise, the idea of becoming a stealthy, horror movie villain and taking out young folks is one that can work. Unfortunately, way too much of the game is spent waiting for something to happen, rather than you being the one creating the action. Whether it was having the Party Hard Killer move faster, or just opening up more ways for you to dispose of your victims, Pinokl Games really needed to add in something to help the experience from becoming stale. This review was based on the Xbox One version of the title, which we were provided with.